Once every few months we'll email you about site additions and cruising news - unless you unsubscribe, of course! 1. We're Jim and Caroline Baerselman, a name of Dutch origin, pronounced 'Barculman' - rhymes with "parcel man"
2. After a 15 year second career as a tour operator (offering sail and windsurf holidays in a variety of locations around the Mediterranean) we sold up and bought a boat for us to use. Well, not quite. Lots of family and friends came to join us once the news got out. 3. A Short SC1, a vertical take off experimental aircraft, pinned to the roof of the science museum until recently. 4. Part of my first career, testing weird aircraft. 5. She's a professional editor - keeps Jim's weird streaks in order! 6. Yes, we're biased. We enjoy a particular style of cruising, outlined at the bottom of this page. This affects our opinions, so use the site with a big pinch of salt, a bunch of skepticism, and anything else which makes it taste better. More Answers; with questions this time. Why Write all this Stuff? 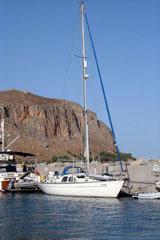 From 1996 to 2006 we sailed the coastlines of Europe - from Scotland to Turkey - living aboard Rapaz, our 40ft yacht. We enjoyed planning where to cruise. Thanks heavens for the Cruising Association library with its unlimited supply of charts and pilot books. But ploughing through loads of detailed pilotage information to find the basics is an interesting but arduous process, and very difficult if you don't have access to a suitable library. Is the area worth exploring? Where can I crew change? Where can I safely leave the boat for days or months? So we summarised answers, cruised the areas, then published answers on this site to help others choose where to cruise. To do this, we highlight the 'must sees' and 'don't bothers' we discovered and give reasons. At first, these were limited to areas we had cruised. Our Helpers. The result was popular, especially with readers from YBW forums and the Cruising Association, many of whom emailed us with texts for new areas, photos, alternative opinions and corrections. Many thanks to all of you, too many to mention individually. The site is now interactive to make these contributions easier. If you register with the site, you can add your comments to the relevant page to correct our (inevitable) mistakes and misjudgments. Our Costs. We pay an annual fee to a "host" to provide a home for this site, and pay to keep software and computers up to date, around £2,000 pa. Chartering boats to keep up to date? No charge; that's fun. As is my writing time. However, I'd like the site to have sufficient value to make it worth while someone taking it over if I drop off the edge. So you'll see adverts appearing, plus a voluntary "donation" button as we explore income possibilities. Any other ideas welcome! Swallowed the Anchor? Nearly. We still sail a few weeks each year, chartering, borrowing, delivering or crewing. But our last long live-aboard cruise was in 2006, after which we bought a summer house in our favourite spot, Finikounda, in the SW Peloponnese. Much of our cruising is now vicarious, through maintaining this site. 2. taking the place of another person or thing; acting or serving as a substitute. If you're passing by, txt us on +44 7802 853564, and we'll pop down to the quay to have a beer - and quiz you for real opinions and updates. More of this vicarious stuff. The quayside café has free WiFi, and there's water and electricity free of charge. Bows to, to step ashore, since there's a bit of rubble at the quay base. We Like: cruise areas with a mixture of harbours and anchorages; day hopping from place to place; having dolphins come and play; pilotage challenges and rock hopping; exploring inland; mooring in the middle of a village; historic town centres; whacky bars; draught beer; rare beef; mussels picked off the rocks; reading; eclectic music; anchorages populated only by birds and seals; the culture shift moving from one country to the next; people watching. We Tolerate: 24hr (or longer) passages; night sailing; overcast weather; rain; <f8 beaufort. But these discomforts sometimes provide superb crescendos of excitement - well worth it to find the next nirvana. We Don't Like: beaches paved with sun-beds and umbrellas; layers of tourist tat hiding great architecture; restaurant touts; heavy maritime traffic; big waves; loud bars full of muscular boozing; fuel refineries; marinas which won't let you in; midges and mosquitoes. But we tolerate them from time to time, since the contrast reminds us why we like the nice things, and a convenient launderette or airport is worth some sacrifice. A "week's worth". We assume you'll be transiting through or chartering within a cruising region. Our "week's worth" assessment is for an un-hurried cruise, with 2 night or 3 night stops in the finer locations to allow proper exploration. Shorten our assessment if you're a hit and run cruiser, as most charterers are! 1-2 - consider avoiding for the reasons given. 3-5 - no strong attraction, but some utility. 6-8 - include these in your itinerary. Tell us your ratings, and why, by adding a comment. Alternatively, send me the price of a beer or two through PayPal! Create an Account - It's Free! See extra detail and "comments"
tick the robot box, pick the pix, then "create"